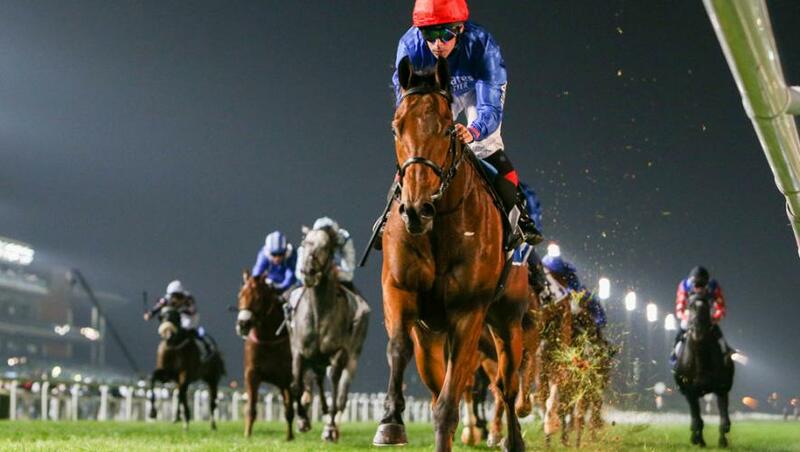 First Nation was the impressive winner of the 10-furlong turf handicap on week three of the Dubai World Cup Carnival at Meydan, UAE, on Thursday, 17 January, giving trainer Charlie Appleby a third winner on the night. The Brett Doyle-ridden five-year-old son of Dubawi, making his first appearance of 2019, was settled in seventh place on the inner as his stable companion Nordic Lights (Charlie Appleby/Colm O'Donoghue) took the 10-strong field along. First Nation was asked for an effort after straightening up and delivered a strong challenge on the inside rail to take the lead from Nordic Lights entering the final furlong. He ran on well to score by four and a half lengths from Nordic Lights, who kept on, and his winning time came to 2m 1.95s on good ground. Charlie Appleby remarked: “First Nation’s work had been very good on his arrival out in Dubai but he sort of went off his work over the last couple of weeks – I don’t know whether he was getting a bit bored at home. “That is why James Doyle ended up picking Celestial Spheres because he was the better work horse. “Nordic Lights has gone out there but, unfortunately, he is very hard on himself. He has still run a very nice race and Colm has kept it very simple. Hopefully, a run like that might settle him down, but he needs to calm down a little bit to help him finish these races out. “First Nation has got a nice tow into the race and Brett has given the horse a lovely ride – he got the splits up the inside. I am delighted for Brett to have a winner as he is a big part of the team. Brett Doyle commented: “There was a good, strong gallop throughout, which suited First Nation as he stays a mile and a half, and he finished the race off well. “He was always in a nice rhythm and it was just a question of getting the splits really. “I could see the leader coming off the rail and a lot of horses have been coming from off the pace tonight, so I thought that inside rail was the right place to be.